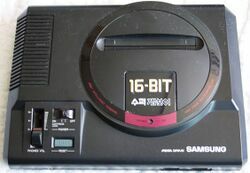 The Sega Mega Drive (メガドライブ), called the Sega Genesis in North America and Super Gam*Boy (수퍼겜보이) (later Super Aladdin Boy (수퍼알라딘 보이) in South Korea, is a cartridge-based video game console developed by Sega in 1988. 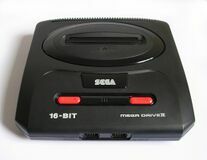 The Mega Drive is Sega's third home console, following the SG-1000 (including SG-1000 II) and the Sega Master System (Mark III). 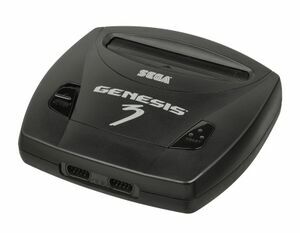 It was codenamed the Sega Mark V during development and is part of what is now known as the fourth generation of video game consoles or the "16-bit era". It has a software library consisting of more than one thousand games released for the system in total. The Mega Drive is Sega's most successful video game console. It sold over 40 million hardware units worldwide, including more than 20 million in the United States, over 9 million in Western Europe, 3.58 million in Japan, and 3 million in Brazil. 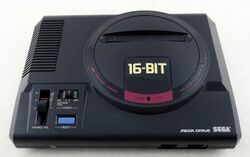 In addition, the Mega Drive sold the most software in its generation, achieving a software-to-hardware attach ratio of 16 games sold per console, the highest ever recorded for a game console. As well as competing with Nintendo's Famicom (NES) and later Super Famicom (Super NES) for market control, Sega also found itself fighting against NEC's TurboGrafx-16 (PC Engine in Japan), SNK's Neo Geo, the Atari Jaguar, and numerous home computers, in one of the biggest "console wars" of all time. The Super NES ended up surpassing the Mega Drive in worldwide hardware sales (49 million), whereas the Mega Drive had higher software sales (its 16:1 attach ratio was double that of the SNES). 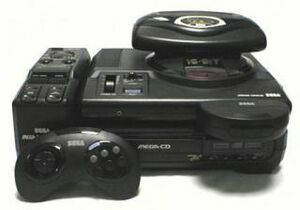 It had a cartridge enhancement chip, the Sega Virtua Processor (SVP), and two add-on consoles, the Sega CD and 32X. 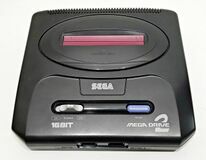 The Mega Drive would be succeeded by the Sega Saturn (released in 1994), and then the Sega Dreamcast (released in 1998). The Mega Drive was envisioned at the next technological step over other video game consoles available at the time. It is a "16-bit" machine, named after its use of a 16-bit CPU (in this case, the Motorola 68000), and was marketed as being superior to popular "8-bit" consoles dominating the market at the time, usually the Nintendo Entertainment System (NES) but sometimes its immediate predecessor, the Sega Master System. 16-bit CPUs had been gaining popularity since the mid-80s, were widely used in arcade machines, and were almost expected to be found in new home computers - it was therefore considered logical that the next "generation" of dedicated video game consoles should follow suit. 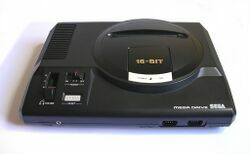 The Mega Drive builds on technology found in the Master System (and with adaptors, is fully backwards compatible), though as well as upping the technical specifications for more demanding gameplay, sound and graphics, makes a number of crucial changes to the design of consoles which continue to this day. Firstly it added a third face button, , to the (now ergonomically designed) control pad. The Mega Drive outputs sound in stereo, and makes an attempt to region lock games through software. Also, when utilising the right cables, the Mega Drive is natively able to produce a clearer image than its rivals (on top of its already higher resolution 320x240 display). All Mega Drives ultilise a top-loading design (as opposed to the cumbersome VCR-style cartridge loading of the Western NES), while having removable controllers (unlike the Famicom). It was designed from day one to allow hardware expansions, and its use of dark plastic means that the "yellowing" of older systems (from bromine-based flame retardants reacting with oxygen) is less of an issue. Main article: Mega Drive consoles. 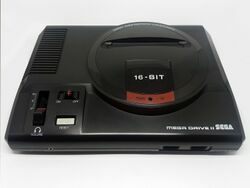 The original Mega Drive measures 28 cm×21.2 cm×7 cm. The top of the unit is split into two components: a circular emboss with the cartridge slot and a tagline (which was omitted on later versions), and a control panel containing the power and reset buttons and the volume slider for the headphones jack. Audio output through the original model was mono through the A/V port, while the headphone jack was used for stereo sound. A third DE-9 port on the back of the unit provided additional peripheral support, though was removed from later revisions. Asian, Japanese and South Korean models have a cartridge locking mechanism which prevents cartridges from being removed when the power is on (which is why "Eastern" cartridges, as well as the Sonic & Knuckles cartridge and various others, have a cut-out on their left sides). Later runs included the TradeMark Security System, missing in early builds causing small compatibility issues, despite the feature having been planned early on. 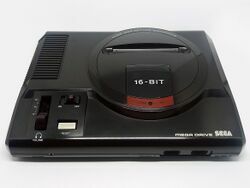 1993 saw this cost-reduced redesign (known as the Mega Drive II in Europe, and sold simply as "Genesis" in North America without the Sega prefix), at 22 cm×21.2 cm×5.9 cm, being introduced internationally. One of the major revisions from the original model was the removal of the headphones jack in favor of stereo output through a redesigned 9-pin A/V port. American and European models used a momentary switch for power while non-western models used a left-right switch. Furthermore, the audio mixing circuitry was modified, resulting in noticeably different quality audio output — here is a page with audio samples, provided by little-scale. A common myth is that the Mega Drive 2 lacks a Z80 — the truth is that it lacks a Zilog Z80. During the Mega Drive's lifetime, Sega received various off-the-shelf chips from different manufacturers, and sometimes would rebrand chips as their own or make them themselves, which is what happened here (and which is why each Mega Drive has a different manufacturer for its 68000). If the Z80 was missing, most games would have no sound (or not all sound). In later revisions, the Z80 was integrated into a custom ASIC which also incorporated the major chips of the system. The Genesis 3 was a small version manufactured by Majesco in 1998 for the US market, which they had been manufacturing for until then. 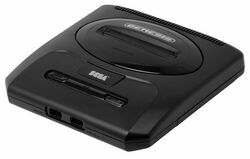 It is much smaller than its predecessors and lacks all expansions and fixes memory controller bugs — both rendering some games unplayable and the Sega CD and 32X unusable. Main articles: Sega Mega Jet and Sega Nomad. The Mega Jet and Nomad were portable Mega Drive systems released near the middle/end of the system's lifetime. The Mega Jet, released in 1994, was originally designed for use on JAL airliners but was later released for Japanese consumers. The Mega Jet is a semi-portable system; the system has a built-in controller but requires an external power supply and a TV. The Nomad was a full portable in its own right, having an integrated screen and sound capabilities, in addition to a battery pack. Main articles: Mega Tech, Mega Play, System C.
The Mega Drive hardware was adapted for arcade use several times over the course of its life. The Mega Tech and Mega Play allowed arcade operators to provide somewhat modified versions of popular Mega Drive games for arcade play — these systems use special cartridges containing games and players can choose from the games plugged into the system. The System C is a different board built from modified Mega Drive hardware, boasting improved color abilities and (in later revisions known collectively as the System C2) improved sample playback. The System C was primarily home to puzzle games — Columns and Puyo Puyo were released on this hardware. Data East is also known to have licensed Mega Drive hardware for an arcade version of High Seas Havoc; not much is known about this board. Main articles: Wondermega, LaserActive, Sega Multi-Mega, Aiwa Mega CD. Combination Mega Drive/Mega-CD units were developed over the course of the Mega-CD's lifetime. The Wondermega and LaserActive are standalone consoles; the LaserActive also plays LaserDiscs. The Multi-Mega is a portable audio CD player that can play Mega Drive and Mega-CD games when plugged in to wall power and a TV. The Aiwa Mega CD is a Mega Drive/Mega-CD packed into Aiwa's consumer-level portable CD stereos. Main articles: Sega Teradrive, Amstrad Mega PC, Al-Alamiah AX-660, Al-Alamiah AX-990. The Teradrive and Mega PC are combination Mega Drive/IBM-compatible PCs made for the Japanese and UK markets, respectively. The three Al-Alamiah computers are combination Mega Drive/MSX computers for the Arabic market. A variety of companies now make licensed system-on-a-chip units in a variety of fashions that contain single-chip Mega Drive implementations and several licensed ROM images. TecToy-made SoaCs also contain several "new" MD games, however these are believed to be — and likely are — Java 2 Mobile Edition games running on additional hardware. For a full list of SoaCs, see the template at the bottom of the page. Main article: Sega Mega Drive/Hardware revisions. Main article: Sega Mega Drive cartridges. Main article: Sega Mega Drive/Technical specifications. 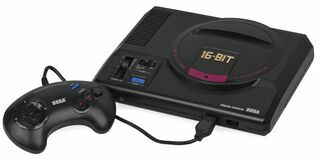 It was the most powerful console at the time of its release in 1988, surpassing the PC Engine (TurboGrafx-16), and it was not surpassed in power until the Neo Geo in 1990. 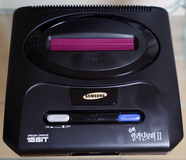 The Mega Drive is roughly comparable to its main rival, the SNES, released in 1990, with the Mega Drive having more raw processing power whereas the SNES has a larger color palette (see Sega Mega Drive/Hardware comparison (Super NES) article for a detailed technical comparison between the Mega Drive and SNES). Compared to home computers at the time, it was not as powerful as the Japan-exclusive X68000 (released 1987) or FM Towns (released 1989). 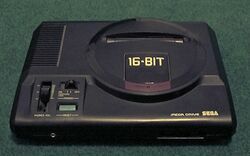 However, the Mega Drive was more powerful than Western home computers in the late '80s, including the Amiga. Main article: History of the Sega Mega Drive. Main article: Sega Mega Drive games. A Japanese Sega Mega Drive (Model 1) overloaded with add-ons including the Sega Mega-CD (Model 1), Sega 32X, Remote Arcade System and Mega-CD Karaoke. Main article: Sega Mega Drive/Magazine articles. Main article: Sega Mega Drive/Promotional material.